Another spoiler: it’s freakin’ cold outside. That’s partly what my blog post is about — consuming JSON data from Open Weather Map and displaying it at the console. That’s not terribly difficult, but the real value added comes from using Google’s Gson parser to convert the JSON objects into Groovy. If you’re new to Groovy, the blog post shows a lot of detail. Regular readers of my blog, however, probably are at least comfortable with the language, so I thought I’d summarize the good parts here. First, I need to show the JSON data, so I know what to map to. I’m using the static prettyPrint method of JsonOutput to make viewing the results easier. As a minor complaint, I have to mention that every time I use prettyPrint, I’m surprised it doesn’t actually print. It just formats the JSON data. I still need to print the result. That seems rather misleading to me. The current temperature is buried inside the object, in the “temp” property of the “main” subobject. I could just parse this using a JsonSlurper, but instead I decided to map the whole thing using Gson. Gson wants a class structure that maps to the JSON hierarchy. Here’s mine, which I just stuffed into a single Groovy class called Model.groovy. I added the data types based on reading the docs, which are pretty thin, and following the nested structure of the JSON data. The names of the classes aren’t important. It’s the property names that have to match the keys in the JSON maps for deserialization to work. Everything is converted to the Groovy class structure, just as expected. Before printing the results, though, I need to do some data manipulation. If you looked at the current temperature value, you might have noticed it’s in Kelvin, of all things. As a US-based developer, I need to convert that to Fahrenheit. The time fields are based on “Unix time”, which measures seconds in the current epoch (beginning January 1, 1970 GMT). Java’s Date class has a constructor that takes a long representing milliseconds from the beginning of the epoch. Finally, the wind speed is in “meters per second” and I want “miles per hour”. When I was in high school (and dinosaurs roamed the Earth), I learned about the Factor Label method, which meant I could memorize a single length conversion and calculate any other. I added all of these to the Model class, and some getters to use them. I should mention that the Weather attribute of the Model class is a collection. Presumably that’s for when there are multiple weather stations associated with a given location. In the source code repository (linked below), I used Groovy’s each method to iterate over them all. Here I’m just using the first one. I like Groovy’s default arguments for methods. If I invoke the getWeather method without arguments (or as the weather property in the usual idiom), then the result is for “Marlborough, CT”. Otherwise I supply a city and a state and they’re used instead. The mps to mph value I got from putting “1 meter per second in mph” into Google, which gave me the proper result. Just to make sure the calls are working properly, here are a couple of tests for the Model class. // Have to check the weather in Java, right? // Any weather stations in Antarctica? So, yeah, it’s cold outside. I also freely admit it’s a little weird seeing those non-US temperatures converted to Fahrenheit. All of this code can be found in the book’s Github repo. I added this to Chapter 2: Groovy by Example. Chapter 2 now uses a multi-project Gradle build, so it doesn’t look exactly that the one shown here, but it works the same way. This process is easy enough to replicate for any RESTful service that returns JSON data. The time consuming part, if any, is writing the POGO structure to capture the JSON tree, but at least with POGOs the result is pretty simple. Now for a few personal notes. First, the latest Amazon review is simply beautiful. 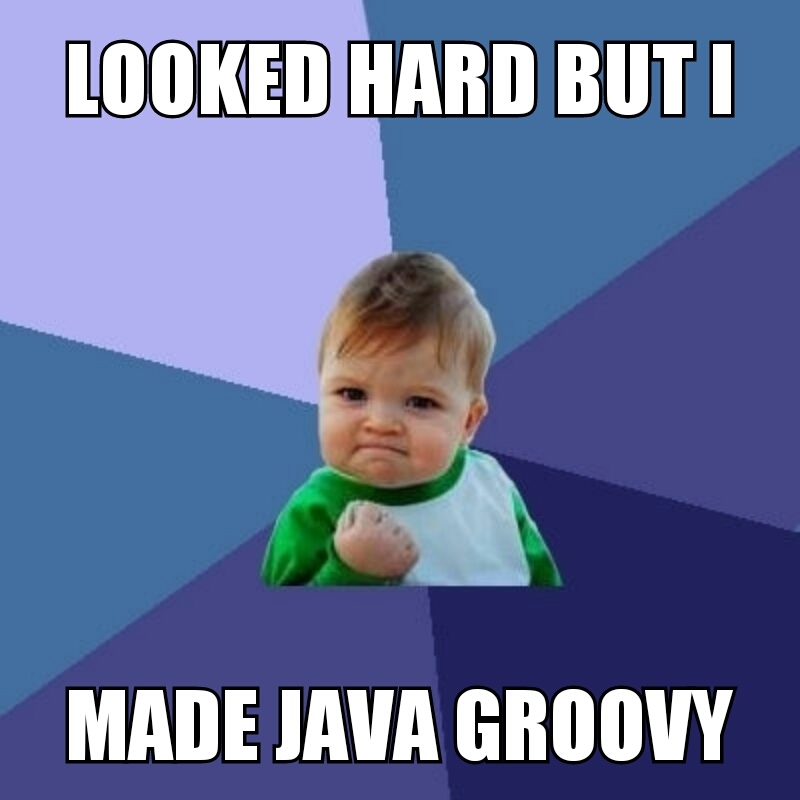 It’s from a person who knew Java and didn’t expect much from Groovy, but found out how much it could help. That’s exactly what I’m trying to achieve. In fact, I’ve been amazed that every single Amazon reviewer, no matter how much he or she did or didn’t like specific aspects of the book, definitely understood the goal and appreciated it. Second, I have a few new projects in the works, but I think I can mention one of them. I’m currently generating a series of screencasts for the book, which I’m calling “Making Java Groovy: The Director’s Cut”. The goal is to discuss why the book was written as it was — what was included, what was left out, what has changed since its publication in the Fall of 2013, and anything else I think might be interesting or helpful. Everyone at Manning has been very supportive of the effort so far. I hope to make at least the first set of screencasts available soon. Third, I’ll be giving a talk at the Boston Grails Users’ Group on Thursday, January 9, at 7pm. I hope to bring some books to add to the raffle, along with an admission to the NFJS event in the Boston area in March. If you’re in the area, please drop by and say hello. Oh, and in case you didn’t hear me celebrating, I’m now officially a 2013 JavaOne Rock Star. Thank you very much to everyone who recommended me. Finally, those of you battling the so-called “polar vortex”, stay warm! It’s cold here, but at least we’re still above 0 (F, not C). Next week I’m planning to brave the winds of Caradhras, otherwise known as central Minnesota. Brr. As the saying goes, follow the great advice found on the side of a mayonnaise jar: “Keep cool but don’t freeze”. Monday morning I gave my “Making Java Groovy” presentation at JavaOne in San Francisco. This is my first trip to JavaOne, and the sheer size of it is rather overwhelming. Of course, it’s also obvious at almost every turn that JavaOne is the weak sister of Oracle Open World, but hey, it could have been IBM, right? I’ve been thinking about this presentation for literally years. I give a related talk on the No Fluff, Just Stuff tour all the time, and I’ve done similar talks at DevNexus, Gr8conf.us, and more. But this is JavaOne — the heart of the Java universe — and doing well here is supposed to mean something. Besides, if the evals are good enough, you can become a JavaOne Rock Star, which is likely the closest I’ll ever get to being any kind of rock star, so there’s that. The biggest thing I worried about, though, was condensing my talk into an hour. On the NFJS tour I’m accustomed to 90 minute blocks, and frankly I can talk about Groovy all day long (and frequently do in training classes). I kept cutting parts I liked, though, until I thought I had something reasonably condensed. Perhaps it’s not surprising, therefore, that I was much more nervous for this talk than normal. Nate Schutta (fellow NFJS speaker and one of the best presenters I’ve ever met) likes to remind me that we speakers are an odd breed. It’s pretty strange to find somebody who both likes to code and likes to stand up in front of an audience and talk about it. Actually, it’s weird enough to do the latter. Most people find public speaking terrifying. Somehow we manage to like it and even look forward to it. I still had time after setting up, so I did a couple of things to entertain the audience before the mics were turned on. One was that I went to http://speedtest.net and checked the speed of the ethernet connection, which came in at around 85 Mbps. Sweet. I did this while the projector was on, partly just to see the reaction and partly to make the “wow, I could have downloaded that whole Breaking Bad episode in five minutes” joke. That is a joke, of course. I would never do anything our corporate masters at the MPAA (and the RIAA) wouldn’t want, and if I did, I certainly wouldn’t admit it in a public forum like this. Then I opened up a tab in my browser to http://emergencykitten.com . I liked refreshing the page anyway, but I claimed I did it in case anything in the presentation went wrong, which might even have been true. I noticed, btw, that there is a GitHub link on emergencykitten.com, which says that the site apparently runs using nodejs on Heroku. If you look in the data folder there, you’ll find kittens.yml (! ), which contains the links to the Flikr pages for all the images. JavaOne wanted me to use PowerPoint, which was a singularly uncomfortable proposition. I used it anyway, but felt free to make fun of it during the talk, especially because it became balky every time I switched from it to a demo and back. The slides are mostly for summaries anyway, since my talk is almost completely code based, but I did add some fun meme-based pictures. The slides themselves are now on slideshare.net, so you can see the whole presentation here. I start with a demonstration that you can execute compiled Groovy code with the Java command, if you just add the “groovy-all” jar file to your classpath. That’s a cool demo, but it also shows that you don’t need to modify your production Java environment at all in order to add Groovy to your system. Then I talk about operator overloading, and how even though I don’t do it a lot, it shows up in all sorts of places in the Groovy JDK. I jumped from there to POGOs, and wrote a POGO that had a couple of attributes and AST transformations for @ToString, @EqualsAndHashCode, and @TupleConstructor, before replacing all three with @Canonical. I then did my favorite demo of accessing and using the Groovy v3 geocoder. The code for that is in my book’s GitHub repository in a couple of different places, along with Spock tests for both online and offline (!) usage. I went from there to my default JSON example, which is still based on ICNDB: the Internet Chuck Norris Database. When I use it now I generally use the firstName and lastName properties so I can replace “Chuck Norris” with Guillaume Laforge, or Paul King, or even Brian Goetz. As luck would have it, the site was up and running, so I was able to do that, too. I’m searching for cat pictures, which as everyone knows is the reason the Internet was invented. Most of the parameters are required, but I used nojsoncallback=1 to keep from wrapping the JSON response in a method. The only tag I submit is ‘cat‘, but I might want to add some more because that doesn’t always give me what I want. You have to be careful with Flikr, though, because you can get back almost anything. Turn the map entries into list elements of the form “key=value” then join with an &; convert the string to a URL and download the text, then parse it with a JsonSlurper. This stuff becomes automatic after a while. The only odd part of this is the WC constant, which is an alias for javax.swing.WindowConstants. I build a GUI with six cat pictures in it, and I’m done. I ran the script and got two cat pictures and four pictures of tractors. I was confused until somebody pointed out that they were probably Caterpillar tractors, which shows what kind of trouble you can get into on Flikr. Believe me, it could have been worse. Bringing it back to the GitHub repo for emergencykitten.com, maybe in the future I’ll grab the Flikr URLs in their repo and do the same thing. Still, this is a reasonably cool demo, and why not live a bit dangerously anyway? The talk went well and a good time was had by all. At least I hope so, though I won’t know for sure until I see the session surveys and find out of I’m a rock star after all. For the record, I’d like to say that as Groovy Rock Stars go, if Paul King is Led Zeppelin, Guillaume Laforge is the Rolling Stones, and Graeme Rocher is the Beatles, then I want to be E.L.O. I always liked E.L.O. and owned several of their albums when I was a kid. Actually, that’s not quite right. I didn’t own several of their albums. I owned several of their 8-track tapes. Whoa. I have to say, though, that the most interesting experience of all was seeing my book on the shelves of the bookstore at the conference. I went in late in the day and was about to frown at the number of copies on the shelf when somebody walked up, took one, browsed through it, grinned wryly to himself, and actually bought the bloody thing. I was extremely tempted to introduce myself and offer to sign it or take a picture of him holding it, but in the end I decided that would be too creepy. My wife, who came along to do sightseeing in San Francisco, agreed with that. Still, I’ll be at the conference until Thursday, so if anyone wants me to add my chicken scratch to their book, just ask around. I promise not to hover too close to the store. This is partly a spoiler for my “Making Java Groovy” talk that I normally do at NFJS events and plan to use in my similar talk at JavaOne, but to celebrate the book going to the printer I thought I’d try to contribute something technical here. I’ve always felt that one of the keys to understanding Groovy was operator overloading. Operator overloading has a mixed reputation, conjuring up horror stories of developers changing + to be *, which might be good for job security but not good in general. To be honest, I don’t do a lot of operator overloading in my own code, but I take advantage of it all the time. Most Groovy developers don’t realize how thoroughly operator overloading occurs throughout the Groovy JDK, among other places. This web page lists all the operators in Groovy and their corresponding methods. 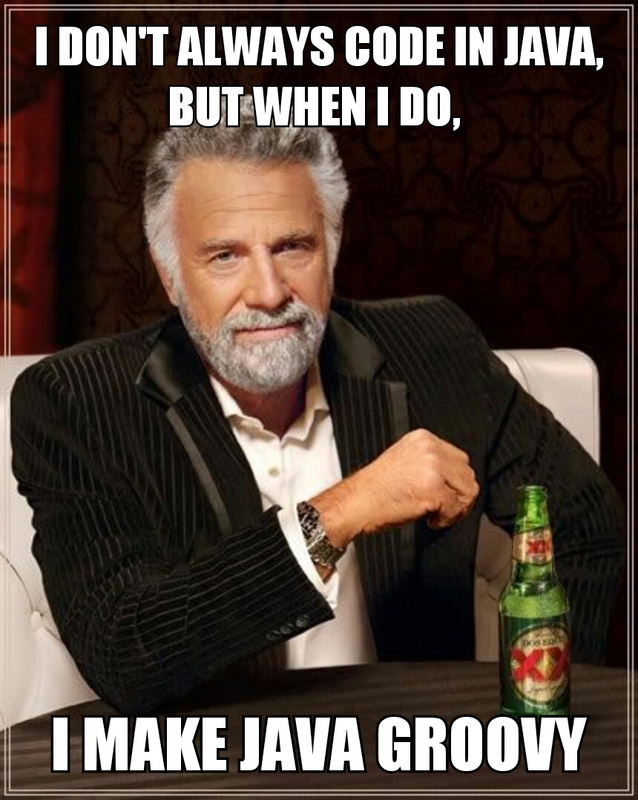 What’s easy to overlook, however, is that every operator in Groovy actually invokes a method. That table doesn’t just provide you with options — it’s what’s actually happening under the hood. Note that it’s not just operators like + or * that call methods. Array-like access (the  operator) calls getAt and putAt on maps, and even == invokes the equals method. Note that in each case, the operator is returning a new string rather than modifying the original. Strings are still immutable, even in Groovy. Let me give a larger example that uses Groovy / Java integration to make coding easier. If you’ve ever done financial calculations in Java (or if you’ve ever seen Office Space), you know you need to use java.math.BigDecimal for the amounts rather than just doubles. But BigDecimal in Java is an annoying class to work with, because (1) you have to instantiate it, (2) you have to remember to use the constructor that takes a String, or the results are not predictable (see the JavaDocs for details), and (3) you lose all your operators and have to use all the associated method calls, keeping in mind that (4) all instances of the class are immutable. That makes for a rather verbose class when all you want is to wrap a numerical value. The only attribute is the balance, stored as a BigDecimal, initialized to zero. Since the attribute lacks a public or private modifier, Groovy automatically generates public getter and setter methods for it. The deposit and withdraw methods take advantage of operator overloading to update the balance using simple + and – operators. Finally, the Canonical AST transformation adds equals, hashCode, and toString methods to Account, as well as a “tuple” constructor that can be called from Java. That’s a lot of mileage for 16 lines of code. Accounts can be created using the normal map-based constructor or the tuple constructor, which in this case has only a single argument (because the class has a single attribute). Accessing the balance property actually invokes the getBalance method, which is supplied by Groovy automatically. The generated toString method is as shown, and to prove that both equals and hashCode are working I added two identical accounts (instantiated by either constructor) into a Set and verified that Groovy added only one of them. The Bank has a method to open an account using a double, which is wrapped in a BigDecimal using the String-based constructor. Then addFunds and removeFunds just delegate to the associated methods in Account. All the tests work without a problem, demonstrating how easy it is to switch from Groovy to Java and back again. If you ever have to add code to an existing Java system that involves BigDecimal, writing a class in Groovy is a very easy way to do it. In my book, incidentally, the chapter on Spring and Groovy uses a similar Account class, but with an added id. Then I implement an AccountDAO interface (written in Java, of course) using the a Groovy class that takes advantage of Spring’s JdbcTemplate (again from Java), complete with Spock tests. If you want to see the source code now, just check out ch07 in the GitHub repository for the book. As in this example, when I code in Groovy I don’t often do operator overloading, but the effects of it show up everywhere. Hopefully these simple examples will help you take advantage of it in the future. BTW, I received notice from Manning that I will have actual hard copies of Making Java Groovy at the SpringOne2GX conference next week. Even if you don’t want one, please come by and say hello. Don’t be surprised if I can’t stop grinning the entire time. This week I’m in New Haven, CT, teaching a class that combines UML and Java Web Services (an odd combination to be sure). The client wanted to use NetBeans as their primary IDE, and I always try to accommodate that if I can. My last exposure to NetBeans was back in version 5.5, I think, when a couple of friends suggested I give it a whirl. I’ve been an Eclipse user since version 1, so I’m very comfortable with that environment. As part of giving a presentation at my local Java User’s Group, I also got a license for IntelliJ’s IDEA, so I’ve been playing with that off an on. When I don’t want to use a heavy IDE, I generally stick with UltraEdit, which does a decent job, even with Groovy code. Nevertheless, I downloaded and installed NetBeans 6.1. I have to say that I’ve been very pleasantly surprised by the editor. The UML support is surprisingly good, including the capability to generate sequency diagrams from code. But its JAX-WS and JAXB support has been outstanding. I’ve been using them with the embedded Glassfish server and really enjoyed it. I’m in a bit of a rush (have to get back to class) or I’d say more. What I can say, though, is that if the NetBeans group really does deliver on Groovy and Grails support in NB 6.5, as promised, I’m definitely going to try it. I’m still mostly an Eclipse person (and the commercial MyEclipse tool as well). I know it’s practically heresey to say so these days, but I’m still finding that IntelliJ slows me down a lot more than it speeds me up. But this single week with NetBeans has been a revelation. I can only hope the Groovy and Grails support when it comes out in October is as good as the rest of the IDE. (with different books, of course) and asked the students to find a book with a particular isbn number and print it’s title and author values. The materials didn’t supply a DTD, so I didn’t have any ID attributes to make it easier to get to the book I wanted. That meant I was reduced to continually using getElementsByTagName(String). I certainly didn’t want to traverse the tree, what with all those whitespace nodes containing the carriage-return/line-feed characters. So I found the book nodes, cast them to Element (because only Elements have attributes), found the book I wanted, got all of its children, found the title and author child elements, then grabbed their text values, remembering to go to the element’s first child before doing so. What an unsightly mess. The only way to simplify it significantly would be to use a 3rd partly library, which the students didn’t have, and it would still be pretty ugly. On the bright side, as a result I may have sold another Groovy course. 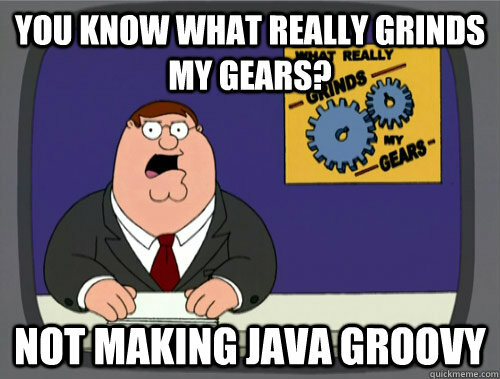 🙂 For all of Groovy’s advantages over raw Java (and I keep finding more all the time), nothing sells it to Java developers like dealing with XML.